WASHINGTON, D.C. -- A little less than half of Americans, 45%, actively try to include organic foods in their diets, while 15% actively avoid them. 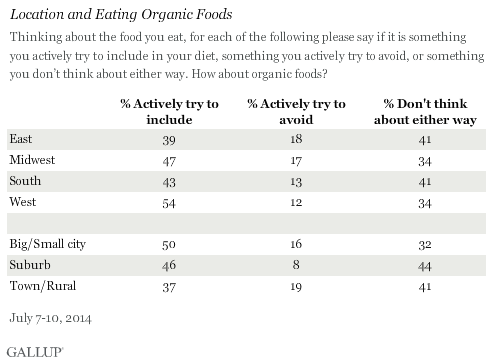 More than a third, 38%, say they "don't think either way" about organic foods. Organic agriculture is monitored and certified by the U.S. Department of Agriculture and must adhere to strict regulations to be certified as "organic." Organic food is free of man-made additions like antibiotics, and organic farming is supposed to be better for the environment than traditional farming. Organic foods often cost more than non-organic foods, which could keep some Americans from including them in their diets. This is the first year Gallup has asked about eating organic foods in the annual Consumption Habits survey. Forty-five percent actively try to include organic foods, putting such foods in the middle of the list of 12 others measured -- trailing fruits and vegetables by a wide margin, but well ahead of fat, soda, and sugar. The 38% who say they "don't think either way" about organic foods is higher than the percentage for any of the other food products. In the U.S., inclusion of organic foods is highest in the West (54%) and lowest in the East (39%). Americans who report living in a big or small city are more likely to eat organic foods than those who describe their location as a town or rural area, 50% versus 37%, respectively, while those who live in suburban areas fall between these two groups. More than half of 18- to 29-year-old Americans actively try to include organic foods in their diets, compared with one-third of Americans who are 65 and older. 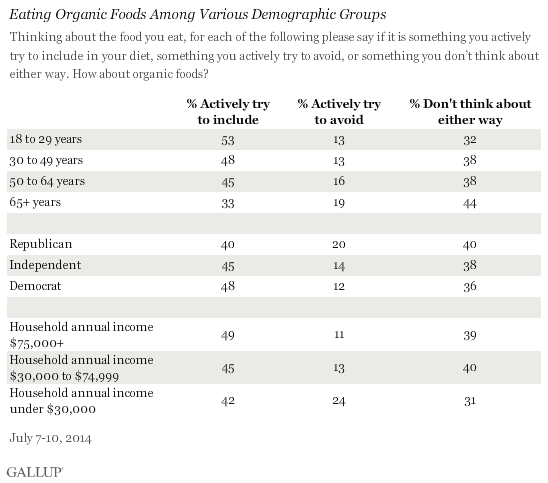 Older Americans are slightly more likely than other age groups to "think either way" about organic foods. Household income is a factor in food choices, with almost half of upper-income Americans actively including organic foods, compared with 42% of lower-income Americans. Almost a quarter of lower-income Americans, however, actively avoid organic foods, while among upper-income Americans it is closer to one in 10. This could be a reaction to cost, as organic foods typically cost 20% to 100% more than non-organic foods. So lower-income Americans could be actively avoiding organic foods because they are trying to save money on food purchases, rather than avoiding them because of health reasons or dietary preferences. Organic foods are subject to strict government regulations in order to earn that title. They can't be treated with chemical pesticides, and growers of organic foods must use natural fertilizers. Often this results in more expensive food, a major downside to organic foods. However, advocates praise organic foods as better for the environment and free of potentially harmful aspects like pesticides and additives. Studies are still inconclusive about whether organic foods are actually healthier. Given that almost half of Americans actively try to include organic foods in their diets, they may view the benefits of organic foods as greater than their downsides, such as the higher cost or limited access. Income and location appear to be factors in preference for organic foods, although that may be changing. Wal-Mart, the largest retailer and grocer in the U.S., and known for its low-price business strategy, has announced plans to begin selling organic food. Organic food could soon become more easily accessible and more affordable, and this in turn could encourage more Americans to include it in their diets. Forty-five percent of Americans worry about their weight all or some of the time, remaining near the level of worry expressed in recent years. Another 29% of Americans are currently trying to lose weight, mainly for health reasons. Seventy percent of Americans who exercised at least 30 minutes every day in the past week expressed agreement that they always feel good about their appearance, compared with 49% of those who did not exercise for 30 minutes on any day.